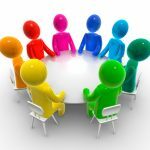 The organisation of the Choir is managed by our elected Committee. 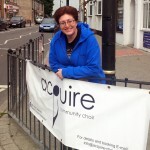 Graham joined Acquire in 2013, having not sung in a choir since primary school back in the 1960s! Ever since then, rehearsals on Sunday evenings have been one of the highlights of his week. 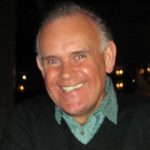 He says, “Sunday rehearsals are lovely way to end the weekend, and set yourself up for the week ahead.” Graham’s current favourites among the choir’s repertoire are “Ching-A-Ring-Chaw”, “Pie Jesu” and “Porgy and Bess”. He is fortunate enough to have performed with Acquire twice in Cardiff, along with Mike Peters and the Alarm, and two BBC orchestras! But he says that all performances are special in their own way, and it’s a great privilege to be asked to sing at local community events. Graham lives in Prestatyn with daughter Alice, and cat Clokey. As well as singing, Graham’s other musical interest is in classical guitar, which he took up comparatively recently, at the age of 54! Sian has been a member of Acquire from the very beginning and sings in our Soprano section. Her favourite songs include, Spider-Man, Facade and You’ll Never Walk Alone. She started singing from a very young age and has sung in many choirs. She always sang alto until she joined Acquire and discovered her range was a lot higher than she thought. 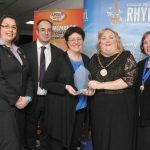 She is also a member of the Rhyl and District Musical Theatre Company and regularly performs in their shows. As a primary school teacher she can often be found putting her singing skills to good use. 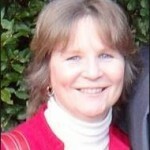 Karen was a founder member of Acquire and has been the treasurer since the start. She has always enjoyed choral singing and has been a member of school and church choirs in her youth. She is a retired teacher and enjoyed singing with the Cheshire County Council Staff Choir. She sang with the Northwich Festival Choir for a short time but left to pursue her other hobby, amateur musical theatre. She has performed in over 50 shows and it was while rehearsing a show with Rhyl and District Theatre Company that she met Leslie Churchill Ward and signed up for Acquire. She likes the wide range of music performed by the choir and has enjoyed being a member of Acquire’s Jazz Choir. She is married to Barrie who also sings in Acquire. Having always had a love of singing but never having had the confidence to try, Hazel jumped at the chance to try out Acquire. After receiving such a warm welcome and feeling uplifted she decided to stay, “music is good for the soul, I always come away feeling reenergised and with a smile on my face”. 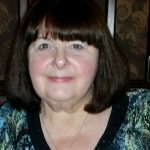 Being a part of the committee has enabled Hazel to share her own thoughts and ideas with others and she enjoyed working with Dawny, organising a wide range of social events for members to enjoy outside of rehearsal and performance times. When Ceri was 8 years old she persuaded the choir master of St Johns church in Rhyl to let her join the church choir. He usually didn’t take choristers till they were 12 but she pestered him every Sunday until he relented. 40 years later she is still singing in choirs! Ceri sang with The Rhyl High School Youth Choir for many years, touring all over Europe and America and recording 3 albums. When the youth choir ended, the musical director formed The Phoenix Singers. Ceri sang with them until they disbanded in 2007. She joined St Asaph Choral Society in 2009 and still sings with them. Ceri joined Acquire in June 2014 after hearing them at their Midsummer Music concert. She was impressed by the variety of songs and the lovely sound they made. She was made to feel very welcome and has made some lovely new and supportive friends. Ceri lives in Rhuddlan with her husband, Rich and her rescue Mastiff, Bryn. She works in the local pharmacy and enjoys reading and going to the theatre. She is looking forward to being a part of Acquires committee. Leslie has had a diverse and rewarding career in the Arts. After graduating with an honours degree in Acting from the Ohio University School of Theatre, Leslie worked for several years as an award-winning professional actor in the States. Since moving to the UK she has continued to share her love of the performing arts with students, performers, and communities through her work as a musical director, theatre director, voice-over artist, and theatre arts teacher.She works with numerous private acting and singing students, facilitates music workshops for various organisations, and also leads music sessions for adults on the autistic spectrum. She has taught at Theatretrain Mold since the centre opened in 2009, with students performing solos in national performances at the Royal Albert Hall and the O2 Arena. She is also the choir leader for the newly-formed Theatretrain regional choir.Leslie is the Artistic Director and founder of Musical Meatballs in MIND, an award-winning performance therapy group for adults whose lives have been affected by mental health issues. She is also the project coordinator for the Llangollen International Musical Eisteddfod’s award-winning inclusion event.Leslie is overwhelmed by the dedication and enthusiasm of Huw and all the members of Acquire! What began as a little experiment has turned into a wonderful choir filled with members who truly embody the definition of community. Huw teaches music and performing arts at Denbigh High School, where he has been Musical Director for over 20 musicals, including Evita, Les Misérables, Sweeney Todd and Jekyll and Hyde. An experienced musician and educator, he writes books for students studying music at A level. 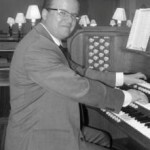 Huw has played the piano since he was eight and is the parish organist and choirmaster at Christ Church, Prestatyn. He particularly enjoys accompanying singers of all ages. A former member of St. Asaph Cathedral Choir and the Phoenix Singers, Huw was delighted to join Acquire when it was formed. He enjoys composing and arranging, and he recently arranged ‘Bohemian Rhapsody’ and ‘Façade’ for Acquire. He says that such well known and dramatic pieces suit the choir very well. They’re also fun to sing. He looks forward to continuing his happy association with Acquire. 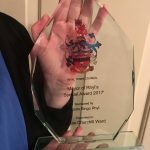 On Friday 17th March 2017 Leslie was presented with a special award from the Mayor of Rhyl in recognition of her services to the community over many years.